Tree Pose also known as Vrikshasana in Sanskrit is a standing balance posture, it replicates the graceful, steady stance of a tree, hence it named as tree pose. It is a beautiful balancing pose, as it brings about a sense of stability, equilibrium and poise in the body and mind. Pay attention to the heart beat and be calm in your mind. It's also good for stretching the inner thighs, chest and shoulders. Begin with Tadasana, a common standing yoga posture. Shift your weight moderately onto your left foot, possession your inner foot firm against the floor and bend your right knee. Stretch down with your right hand and hold your right ankle. Take your right foot up and place the sole against the inner left thigh, if it is achievable, press the right heel into the inner left groin, toes are pointing towards the ground. The center of your pelvis should be directly over your left foot. Rest your hands on the top rim of your pelvis. Make sure that your pelvis is in a neutral position, with the top rim analogous to the ground. Extend the Coccyx (Tailbone) toward the ground. Squeeze the sole of your right foot against the inner thigh and resist this act with your left leg. Press your hands together in prayer seal (Anjali Mudra). Look softly at a fixed point in front of you on the floor about 4 or 5 feet away in order to maintain your balance. Stay in this posture for 30 seconds to 1 minute. 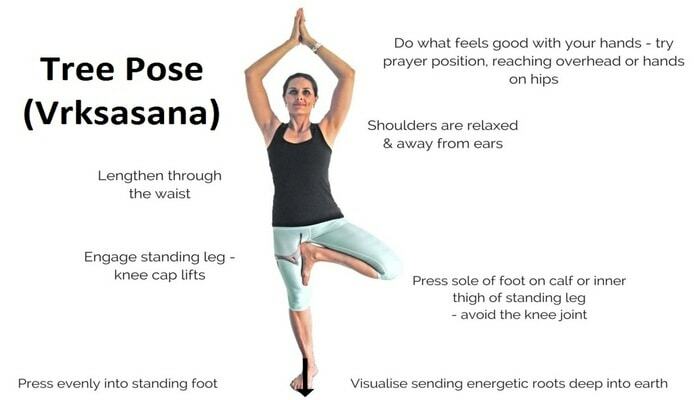 This asana Stretches the entire body from toes to fingers, thus energize you. improves your stamina, immunity and concentration. It creates peace of mind, which is good for those who are facing the problem of depression and anxiety. Very good for your hips as it helps to open it. Good for your knees. Especially people who are suffering with knee pain should do it. Helpful for those who are facing sciatica. But one should practice this under the supervision of a yoga professional. Helps to improve the flexibility of legs, back and chest muscles. This posture builds strength in your ankles and makes them stronger. It gives satisfactory stretching to the groin. Helps to cure rheumatic pain and treats numbness. It calms and relaxes the mind as well as the central nervous system. 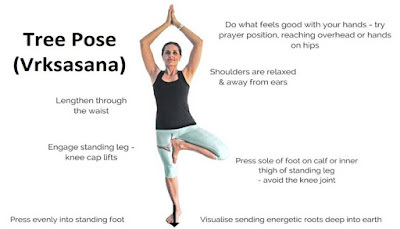 Do not practice this asana if you are suffering from High blood pressure, Low blood pressure, migraine, sleeplessness, knee problems and hip injury. Take a support of wall if you feel unsteady in this pose. Note : Proper breathing procedure is important dimension to the practice of yoga poses. The same things are put in with Vrksasana. While in “Tree Pose”, breathe in and raise your both arms above your head and form Namaskar mudra. To release Vrksasana, breathe out while returning to your beginning position ( Tadasana). Breathe deeply and evenly for some time as this will help to relax your muscles and increase your focus.